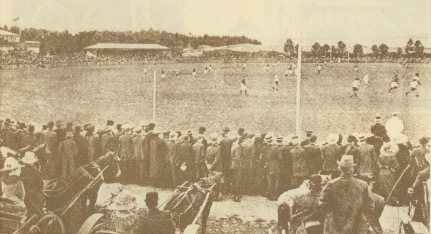 Football on Corio Oval in 1913, the Geelong Football Club’s home ground from 1878 until the Second World War. Source: John Reid, Geelong: A Photographic Album of Historic Photographs in Sepia, 1838–1988, Joval Commercial Productions, Bacchus Marsh, 1988, p. 95. Melbourne and Victoria are very strange places. All through the summer when tennis and cricket occupy most of the media sports space, there’s almost as much writing and talking about footy even though there’s not a single game being played. So the domestic code has a huge hold on our consciousness and has had since the middle of the nineteenth century. But why is it so? How and why did it all begin? People in and around Melbourne had been playing a species of football almost since the first Europeans settled in the 1830s. We don’t have much detailed information about these games, but some of them were predominantly kicking affairs played by small teams for money or other prizes and hence according to some local rules—you don’t risk money unless you know the rules. The same was true incidentally in the United Kingdom from where most of the migrants came, but within a few years a new and distinct form of football had begun to evolve in this part of the world. Historians have been debating for decades the reasons why we got a unique code of our own, but have ignored the most important one. I’m guilty too. The reason was staring me in the face, but I couldn’t see it. I was interested in the migrants and what they brought to Australia, but I never asked, ‘What happened when the migrants didn’t come?’ In the 1850s some 313 000 people came to the newly separate colony of Victoria, most of them in search of gold. Over the next twenty years only 28 000 arrived, roughly 1400 a year and not all of them young men of sport-playing age. So for twenty vital years there was never a critical mass of migrants with a background in other forms of football to challenge what the locals were doing. Footy had its first (demographic) free kick. What the Victorians were doing, meantime, was drawing up a code that resembled closely what was happening in some of the English public schools of the day. In 1859 after a particularly violent kick-about in a paddock near the current MCG a small group of players drew up a set of rules for the Melbourne football club. Four years later the Football Association in England drew up another set, which were very similar. From then, however, on the rules in the two countries began to diverge. Victoria adopted a handling and running form, while the UK plumped for what became soccer, entirely a kicking game, and rugby, another handling and running game, both with offside rules. While devotees of rugby came to New South Wales in numbers, next to no soccer or rugby folk came to Victoria. Within Victoria there is another significant demographic story. Melbourne grew spectacularly at the expense of its rural and urban hinterland. Failed gold-seekers and others flocked to the metropolis. Melbourne’s population more than doubled between 1861 and 1881, reaching a quarter of a million, while Victoria’s total population only grew by 60 per cent. Even Geelong, which had ambitions to be the pivot of the Victorian economy, stagnated. In the late 1850s its population was just over 23 000 but by 1881 it had only added 145 people. Yet it is Geelong that produces the most successful football team of the first few years of the domestic game and again in the late 1870s. So no migrants, no soccer and the birth and adolescence of the local code. It was not till the 1880s that migration resumed on a significant scale. ‘Marvellous’ Melbourne had a dramatic economic boom and drew in the newcomers in significant numbers. Among them were many with a background in Association football who formed a number of clubs in Melbourne, played the first inter-colonial games in 1883, and competed for a number of cups and prizes. They had little more than a decade to establish themselves before a long period of economic depression set in and migration virtually ceased again. It was not until the first decade of the twentieth century that renewed migration to Victoria brought people like Harry Dockerty from Glasgow to re-establish soccer in Melbourne. He presented the cup which is still being played for in 2016 by Victorian Association football teams. Tony Ward has argued in recent articles that the early achievement of a Saturday half-day in Victoria, initially by the stonemasons, meant more leisure for some skilled workers and hence a chance to attend sporting occasions. Others, like the tramway drivers, worked broken time and had gaps in afternoons. But it was probably the growth of a middle-class with discretionary income and more control over their working hours that enabled men and women to attend matches in significant numbers. My argument here about the key role of the absence of inward migration reinforces the importance of demographic factors in the establishment of football in Victoria. One other matter needs to be emphasised. The people who promoted football in Melbourne and Victoria in the newspapers of the mid-nineteenth century were, like the framers of the first rules, recent migrants with a knowledge of the English public schools and their games. On the other hand, they knew nothing about the varieties of football already being played in Victoria, and hence, in ignorance, could believe and assert that they were introducing football to the colony. Their unconscious imperialism helped establish the local code and gradually obliterated domestic and overseas rival forms. It’s a mindset that hasn’t entirely vanished today. The full story, complete with the relevant statistics, is in an article in the International Journal of History of Sport, available on line at http://tandfonline.com/doi/full/10.1080/09523367.2016.1147430 free until the end of May 2016 and later this year in hard copy.